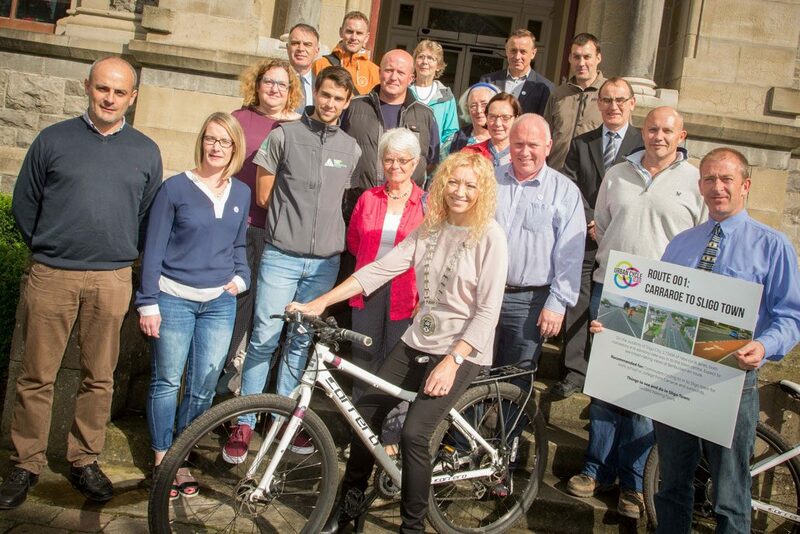 Urban Cycle Sligo, a new project led by Sligo County Council, in partnership with the Department of Transport, Tourism and Sport, and the Active Travel Towns initiative, was officially launched on Thursday September 15th at a special event in City Hall. Six new cycling routes, reaching over 40KM, and contributory links have been developed across Sligo town and its environs to encourage more people to travel to work or school by bike. In 2011, just 2% of commuters living within 3km of Sligo town travelled by bicycle to work, school or college. With the provision and upgrading of cycling infrastructure, it is hoped to considerably increase this figure in the coming years. New cycling routes have been developed from Carraroe, Cleveragh, IT Sligo, Rosses Point, and Finisklin Business Park. Sligo’s five-year Walking and Cycling Strategy, developed in 2012, provides for a combination of cycling and walking infrastructure linking the outlying population centres to the main centres of Employment, Third Level College, Secondary and Primary Schools, leisure areas and Sligo Town Centre. This new initiative in 2016, launched as part of European Mobility Week, has been developed to provide spine cycle routes from key residential areas to the Town centre which enable cyclists to travel from all directions to Sligo town, using new advisory and mandatory lanes. Sligo was one of twelve towns designated an ‘Active Travel Town’, and received funding under the previous Active Travel Towns scheme to implement the first two years of the strategy. Funding of €500,000 was secured in late 2013 and this provided the new cycle lane link routes in Finisklin Business Park. A Schools Poster Competition has also been launched this week with primary and secondary schools invited to participate. Further information about the project can be found online at sligoactivetravel.ie or follow the campaign on social media @UrbanCycleSligo.